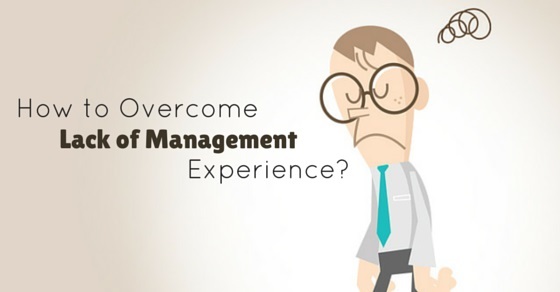 How to Overcome Lack of Management Experience? So you have the skills, the education and the necessary qualifications. But the only thing that stops you from landing the job of your dreams is lack of experience. You have just entered the world of jobs and marketing and hiring managers are always in search of candidates that have several years of experience. Even though this is a big turn off and a huge setback, you still have to deal with it. Not having enough experience can really feel miserable, especially if you know this is the job you have always wanted. However, it is definitely not the end. You can always learn how to overcome lack of experience, especially in the field of management. Would you like to learn more? Then continue with your read. You are definitely going to be benefited. This might actually help you quite a bit! When you have limited experience, forging new relationships and building up on the present ones might actually be of good use. Even though it is quite easy to disqualify people who don’t have much experience, you can still make up for it by showing how enthusiastic you are. Trying to be social and try to establish new connections. Try your level best to overcome the fear by boosting new lines of communication and ultimately building better channels for networking. You can always make up for your losses by asking the right kind of questions. This should make you better than the best. Your task here is to prepare a list of questions you should definitely ask your employers. Since you are an entry level candidate at this stage, try to show some interest and enthusiasm towards the organization by bringing in your A game. Make the best conversation you possibly can by networking and doing some research about the company from beforehand. Another thing you could definitely try is showing yourself as different. Look for ways in which you can speak about the experience that you already have. Elaborate and expand on this to create a new impression altogether. You may also try something interesting by producing a work sample. If you have organized an event in the past, speak about the role you played and the objective of this event, the actions and the sort of results you got. If you have started a new business, mention how you have strategized and planned events and the outcome. Another alternative could be speaking about your recent internship. You could speak about the work you did and the contributors towards your team. When you are sitting for an interview or trying to make up for having lack of experience, one advantage you can possibly get is to get hold of information as much as you possibly can. When you have enough information, you automatically have the power to investigate the employer. At this time you can ask a couple of questions that are powerful and could help in making a different impression. In fact, you could make a much better conversation than people who didn’t do their homework. You may also investigate, the competition and customers. This will help you learn a lot more about the work environment, the culture that exists there and the different opportunities you could make use of. After this, you can come up with some killer questions that will set you apart from the rest. To make up for lack of experience, you need to mention your skills. This could actually take you far. Yes experience matters but we cannot ignore adaptability at the same time. You need to find a way to make use of the experiences that you already have and to translate it in such a way that will please the employers. So when the employer says something like “ I see you don’t have any experience in the jewellery industry”, you should go ahead and say something which goes like this “well since the company is in search of someone who can handle the social media campaign, I can definitely be of some good use. I can attract clients on a regular basis and find more opportunities. Hiring managers have often mentioned that when they are offering jobs, they are always in search of someone who really wants it. So one way to show off to the manager that you are interested in the job is by showing an excellent starter plan! This will give you the opportunity to show off some of your best skills, your thinking ability and of course to shift the conversation to speak about what you can actually do in the job. The best way to do is by simply creating a 90 day plan where you can mention the important tasks, the goals and objectives that you would like to target and bring that in front of the interviewer’s process. Did you know whining a bit could help you nail the job? Of course we don’t mean you literally have to whine like a baby. There is a way to do it as well. There are so many graduates you have been short listed for interviews but later on they fail because they didn’t have enough experience. But you could stop this from happening to yourself. When you are told something about lack of experience, you should speak about how unfair that is to you because it isnt possible for anyone to have experience if they don’t land a job because of the same reason. This can actually help you get the job. In fact, some people who have tried this strategy earlier have been able to get the job. And so can you if you have enough confidence to nail it. Another way to make up for lack of management experience is by coming up with a decent cover letter. If you send them a cover letter, the hiring manager will understand that you do care about the job and that it is important to you. This will let them think about you again. Highlight what is possible for you and keep miles away from comparisons to your co workers. It is also important to have some experience if you don’t have all. Most hiring managers are in search of those who have little mechanical technical and developmental skills. Soft skills are also important up to a certain extent. In other words, don’t keep waiting for the day when you get hired. Get up and do something already. You can begin to express yourself through blogs, meet ups, tweets, blogging and consulting. This would be a great way to gather some more experience and showcase some of your work knowledge and the ability to network. So if you are a young professional, stop worrying if you already are and get to work. In fact, a couple of studies have shown some positive signs. There have been over 25% of the people who took up an unpaid job just to get some experience. Leaders from all over the world have spoken about how important results are for you and that you are interested. This is why it is vital for you to focus on the communication patterns and skills. You must forge new relationships with PR managers, executives and retailers, designers etc. Even mastering the art of social media marketing can also be of some help in this case. This will also send your employees a strong and powerful message about your power and ability. The best way in which you can prove yourself as valuable and important to the industry is by simply focusing on the growth of business and its development. When you are interviewing for a job, you should try to collaborate with new business interests and show your interest in networking. It doesn’t matter if you are looking for new clients, just try to make it obvious to the employer that you aren’t even shy about going beyond the walls of the cubicle to allow the company to reach heights of success. To create a good impression, especially when you don’t have enough experience might not be all that easy. But hopefully this problem will not last too long! The tips and suggestions have been tried and tested too. You can definitely refer to them and utilize them as much as possible. You may also tell us about some of your work experiences. On that note, good luck!